Place cubed pork in a baking dish just large enough to hold a single layer. In a small, nonreactive bowl, stir together 1 cup juice, 1/4 cup oil, thyme leaves, and rosemary; pour over pork to coat. Cover with plastic wrap, and let marinate refrigerated at least 4 hours or up to overnight. Remove pork from marinade and pat dry; discard marinade. 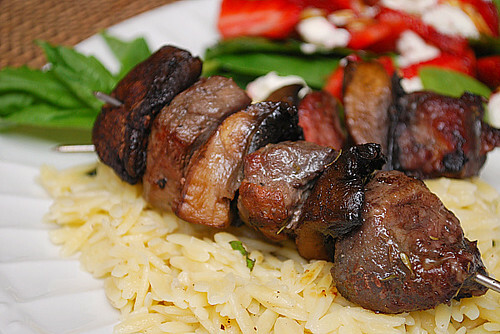 Alternate skewering pork and quartered mushroom caps onto skewers. Brush kabobs with olive oil and grill over medium high heat until cooked through, about 5-7 minutes. Wow. The meat looks perfect! So moist and a lovely color. wow this is a marvelous kebab! !